The WRL60 series of sealed key lock switches from Lorlin are single, double, 3 or 4 pole switches with between 2 and 6 positions and maintained operation. Designed for cut outs of 16mm diameter and using flat key types with 200 different combinations, the key is removable in all positions with indexing at 60°. The WRL60 series of sealed key lock switches from Lorlin are single, double, 3 or 4 pole switches with between 2 and 6 positions and maintained operation. Designed for cut outs of 16mm diameter and using flat key types with 200 different combinations, the key is removable in all positions with indexing at 60°. 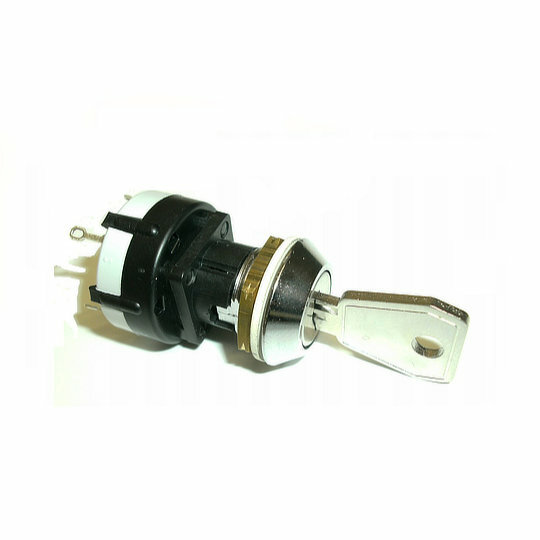 Electrically rated to 150mA at 250VAC/DC and 1A at 24VDC with solder or PCB style terminations a mechanical life of 10,000 cycles and sealed to an IP67 rating. The WRL60 series is perfect for applications where security for system activation in a sealed switch is required such as Industrial Control Systems, Robotic Systems, Automated Systems, and Secure Control Panels.